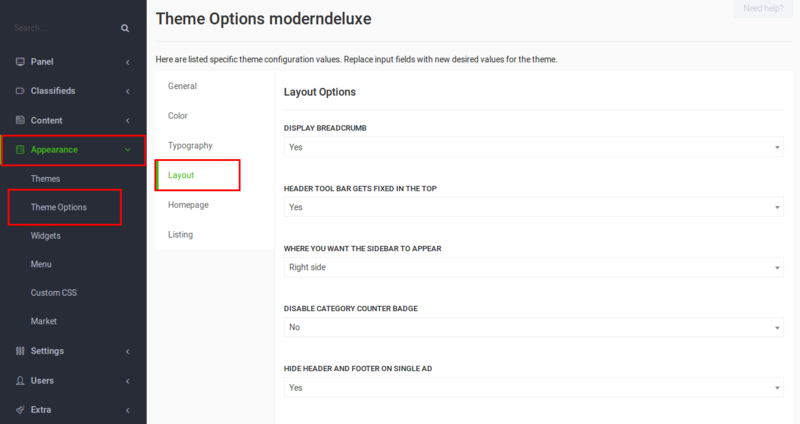 The ModernDeluxe 3 theme is the newest version of our ModernDeluxe theme. It offers a carrousel on the homepage that makes it possible to show a great variation of ads. As the name suggests, the design is modern and has a luxurious appearance. The colors can be easily changed with its color schemes. Search for Modern Deluxe and click on Activate. Display breadcrumb: If it’s enabled, breadcrumb is displayed on the website. Header tool bar gets fixed in the top: Decide, if while scrolling your page down, the header from the top will move and be always visible (choose YES) or not (choose NO). Where you want the sidebar to appear: Choose if you want the sidebar to be displayed on the right or left of your website. Disable category counter badge: Choose if you want to display the category counter badge in the homepage. Hide header and footer on single ad and user profile page: Removes the header, breadcrumbs and footer on a single ad and on the user profile page. Enable to show the user profile page like “your store”. Display slider in listing: Except from the slider at the home page, you can activate a slider in the listing pages with a latest ads of the certain category. 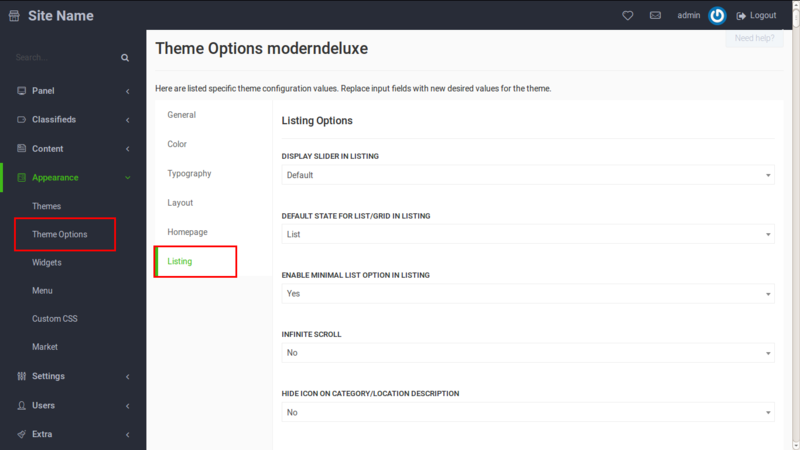 Enable minimal list option in listing: Choose the width of your website layout. Hide icon on category/location description: Choose “No” if you want to display the category/location icon on category/location page. Listing random position banner, allows HTML: Text or banner that you paste in this field will be displayed in a random position among the advertisements in the listing. Content shift right to left: Activate right-to-left theme orientation. Uses CDN for CSS/JS: Increase site speed by using content delivery network for CSS/JS (deactivate this option if you get an error with JS).